These Chardonnay wine kits from Vinter's Reserve are almost as easy to make as they are to enjoy! Home wine making concentrate kits from Vintner's Reserve wines offer excellent quality flavors and aromas. The perennial white wine favorite. A remarkably versatile wine, this classic now includes oak for a rounded vanilla-oak structure that is smooth and appealing. Dry, with pleasant acidity, Chardonnay's complexity is fully realized when aged. white wine for my fiancee, maybe she'll let me make wine for the wedding! I experimented with a different yeast and it seems to have a slight metallic taste. It is still quite young, so it could change. I ordered another one and intend to use the yeast in the kit. I also intend to use oak powder since chips have no effect. We are primarily red wine drinkers and have made over 30 red wine kits, but always like to have some white wine on hand and available to serve friends and family. This is a very nice chardonnay for a good price! I often find myself grabbing it instead of a red. It got rave reviews from everyone we've served it to. I love the buttery oaky flavor. I have made many kits and typically stick to the higher end kits and limited edition kits for red wine. 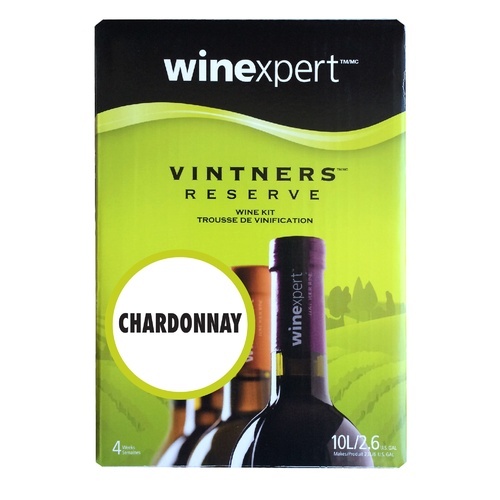 I tried this Chardonnay kit 2 years ago when I first started making kits based upon the many good reviews I saw at various sites and also because of its great price point. I love it! It is lighter and has more of a crisp fruity taste (but still very dry) than the buttery chardonnay style. I prefer a crisp Fume Blanc style Chardonny so this kit is perfect for me. It is OK after a several months but give it 6 or more months and WOW! Am starting my 3rd batch and have a new kit on order so I don't run out . Plan to make it up soon as well to replenish my cellar. This was my first wine kit and it was really easy to do. I had no problem producing a great tasting wine that you might expect in a restaurant. I am not a wino but I do like some wine once in a while, and this was a good one when I cracked open the bottle the first time. I was proud of it, especially with the little work that it required. This is a very good chardonnay for the cost of producing it. Everyone in my family liked it and I am buying a second kit today because the first one is almost gone and the Shiraz kit is almost ready to bottle. An empty fermentation vessel needs to be filled.